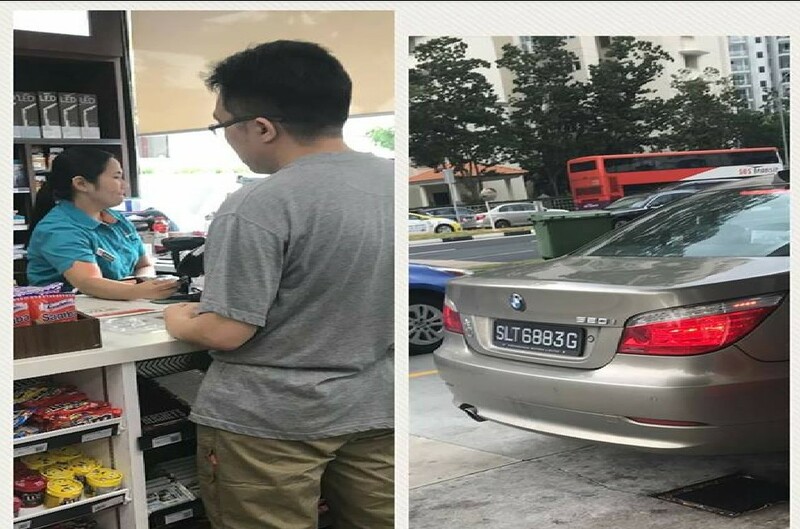 BMW DRIVER MADE ELDERLY PUMP ATTENDANT PAY FOR $125 OF PETROL!!! You are at:Home»Caught In The Act»BMW DRIVER MADE ELDERLY PUMP ATTENDANT PAY FOR $125 OF PETROL!!! I earlier witnessed an incident at Caltex Tampines Ave 8 @2pm on 14 April and it filled me with such indignation that it prompted me to write this to you, hoping that you could help alleviate the financial obligation of your employee and implement appropriate measures to handle the incident as follows. While processing payment at the Cashier counter, the customer (picture uploaded herewith) and driver of BMW vehicle SLT6883G, claimed that your pump attendant had mistakenly refilled a full tank of petrol costing about $135 for his vehicle instead of the $10 petrol that he had instructed. He refused to pay the full amount and insisted to pay only $10 for the full tank. The pump attendant probably in his early 60s, was subsequently summoned to the Cashier counter to verify. He explained that he had heard that it was a full tank refill but the customer immediately rebutted it. What happened next astonished me. Instead of creating a scene by engaging in an argument with the customer, the elderly pump attendant calmly informed the Cashier to let the customer pay $10 and he would personally absorb the rest of the cost. As a result, the customer walked away smugly paying a mere $10 payment for a full tank of petrol for his BMW Series 5 vehicle. Also, assuming it was entirely the pump attendant’s oversight, under such circumstances, perhaps the Cashier could have proposed to the customer to pay for a partial amount instead of allowing the elderly pump attendant bear full monetary responsibility? Alternatively, for proof of evidence, perhaps Caltex can install CCTVs equipped with audio recording of drivers’ instructions to the pump attendants at each pump? What are Caltex’s existing guidelines and policies to handle such situation? I am concerned that if no effective standard operating systems are defined, such practices of having pump attendants to bear the price discrepancies can lead to abuse. Imagine if one uses this approach on each petrol station in Singapore every few days, it is tantamount to one walking away striking lottery frequently and the accumulated value will be very substantial! Original post by Ms Kelly Yeo. I copied the context incase her post got taken down. Please hunt this fucker down! Previous ArticleE-F*CKER RIDER CRASHED INTO SMALL GIRL TILL JAW MUST REALIGN!!! Next Article DOES HIS FATHER OWN THE TRAIN? PLEASE ENLIGHTEN ME!